Not the original, but it's a good one! This week offers yet more catchup titles, consisting of games released in North America within the past few weeks, as well as the last few months. There's also two new games, however, both of which are for DSiWare and both of which are new instalments in two series which have been going for a while now. Hydroventure (Nintendo, 1200pts) – Another unique, quirky physics-based puzzle game, this one is published by Nintendo themselves, so you can be almost assured of quality. It's been out in North America for some time under a different title, so you can read our Fluidity review to see why it's worth getting. Mix Superstar (Digital Leisure, 500pts) – Digital Leisure has pumped out some not-so-stellar titles, but don't be quick to write this one off as a guaranteed failure. There's plenty of music creation "games" on DSiWare, but WiiWare was lacking in this department until now. It got it right on the first try however, as this tool is surprisingly good. You can read what we thought in our Mix Superstar review. Hydroventure (Nintendo) – As seems to be a trend recently, if you want some more convincing besides our review, you can also play a demo version. Mario Party 2 (Nintendo 64, 1000pts) – Nintendo has chosen to skip the first part of the Mario Party series for VC release, which is slightly disappointing for those not familiar with the series' humble beginnings, but don't worry too much, as number 2 is generally considered to be the best game in the series. We'll have a review available soon. Zenonia (Gamevil, 800pts) – A serious attempt at a DSiWare RPG, this one trumps any other attempts made so far and then some. Aside from having great gameplay it's also quite lengthy, so this one will keep you satisfied for some time to come. You can read our Zenonia review for more information. GO Series: Dark Spirits (Gamebridge, 200pts) – Gamebridge's latest Japanese game, this is actually another game from the G.G series, which is being released in North America and already came out in Japan. This one is a horizontal shoot 'em up, which we'll have a review for within the next few days. Music On: Drums (Abylight, 500pts) – If you've bought any Music On titles so far you should have a general idea of what to expect from this one - Generally the same stuff, just with a different instrument, in this case, drums. We will of course review it soon. Anything that catches your eye in this update? Mix Superstar is downloading as we speak. Curious about Fluidity, but glad that we get a demo. Huh I didn't know they changed the name for europe. BTW, the Bit. Trip Fate demo is also back in the demo section. Dark Spirit Looks very fun. however I am playing Super Mario All Stars on the Wii, So I'm happy with that. GO Series Dark Spirits costs only 200 points, not 500! I'll probably buy it. Seems a simple choice. Hydroventure all the way. Will make for an amazing Christmas Eve gaming session. WOOO I finally have a Mario Party game on my Wii VC!! Only 2 left now, Nintendo. It's annoying that nintendo aren't releasing the first Mario party on vc, probably due to the blisters that it caused people but the second still looks great and I'll definetley get that as well as zenonia. G.G. series dark spirits looks awesome too. The best Mario Parties are the unpair, the 3,5 and 7, and in second place i can put the 6 and the 2 and the regular i consider are the 1,4 and 8. 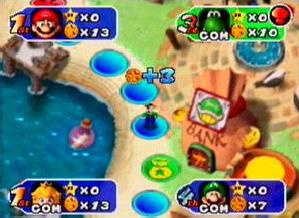 It would be cool to have the original Mario Party as a Club Nintendo exclusive with a disclaimer to "play at your own risk" for like 500 coins or something. Zenonia, you will be mine! This is quite a good week actually. Any word on Shantae yet? I'm getting impatient. What's with Nintendo and all these weird name changes between US/Euro? I'm not sad about skipping Mario Party 1... I doubt the modern joysticks would hold up too much longer than the classic ones. I downloaded it at midnight. Or games are purchased or downloaded?